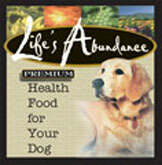 Life’s Abundance Premium Health Food for Dogs contains only fresh, natural, wholesome ingredients. And, it has a taste that Dogs Just Love. It provides 100% Complete Nutrition in accordance with AAFCO feeding protocols. This premium health food is a high antioxidant formula and contains 3 sources of superior protein ... chicken meal, egg and fish meal plus carrots, apples and more. There is no corn, wheat, dairy, by-products, artificial colors or flavors in Life's Abundance. * Our chicken is from selected high quality chicken meal derived from human-grade processing plants. Removing the water and moisture provides a more concentrated form of protein. * Egg is a complete protein. It is one of the most digestible forms of protein and full of vitamins A, B, E, K, biotin, sulfur and amino acids...all needed for cell growth. * Fish Meal is high in Omega-3 Fatty Acids, great for the health of your dog’s skin & coat. * Life's Abundance is rich in powerful antioxidants from whole food sources such as carrots, spinach, celery, garlic, alfalfa leaf and apples. We've also added grape seed extract, one of the finest and most potent antioxidants known today. * Life’s Abundance contains brown rice ... one of the most digestible carbohydrates supplying your dog with a superior energy source. * Life’s Abundance is nutrient dense with vitamins, minerals, fats and fatty acids essential for the optimal health of your dog. Our minerals are chelated for maximum absorption. * Life’s Abundance uses Probiotics and beet pulp which promote a healthy digestive tract. Lactobacillus Acidophilus helps to maintain the delicate balance of friendly bacteria in your dog’s intestines. Beet pulp is a great source of fiber, and unlike many other fiber sources, produces special components called short chain fatty acids which the good bacteria depend upon for food. Try Some Online Here Today! your purchase, HealthyPetNet has a 30 day money back guarantee. want the best possible for them!